Do you want to have an easier time doing your accounting? Are you looking for a tax deduction? 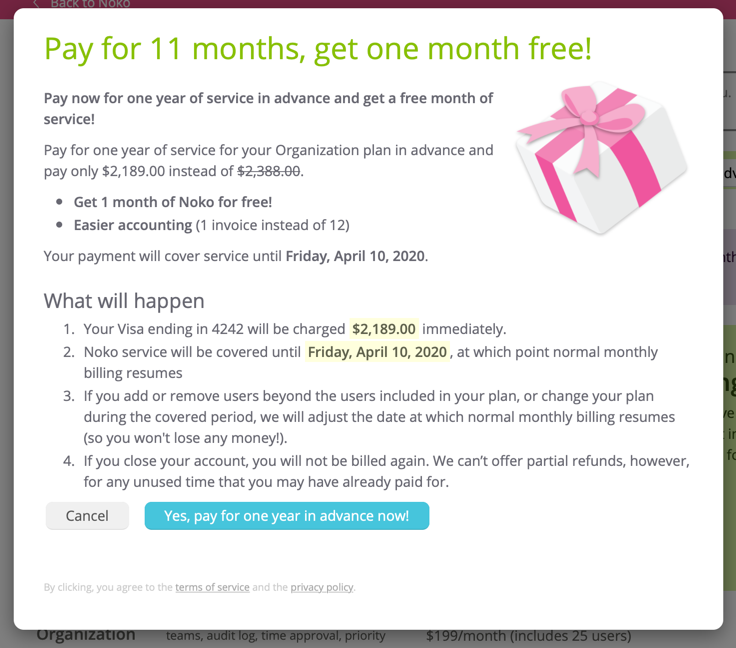 Noko gives you the option to pay for a year of service in advance. In just two clicks you can pay for a year of Noko AND get one month of Noko for free! That means easier accounting (hooray!) because you'll only get one invoice instead of the usual 12. Please note that you can only pay in advance if you haven't done so in the last 6 months. You also can't pay in advance if your account is overdue (a new credit card has to be added first to pay the current bill). 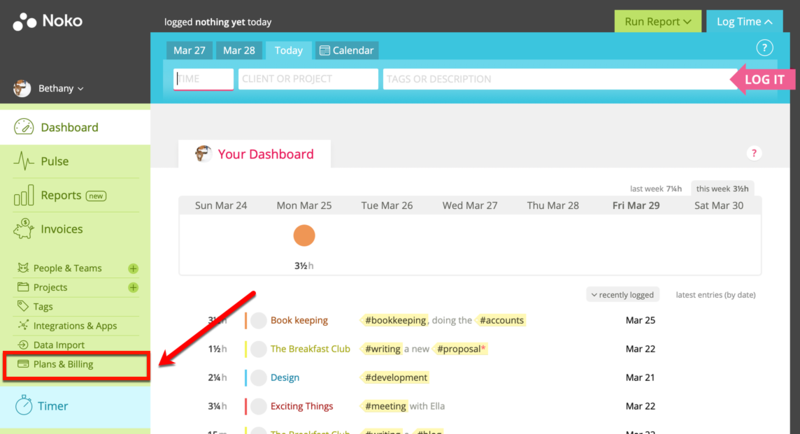 Click on the Plans & Billing in the green navigation sidebar. In the green "Special Offer box" at the top of your screen click the "Pay in advance & save" button. Read carefully what will happen when you pay for a year in advance and when you're ready, click the Yes, pay for one year in advance now! button. During the 14-day free trial you can choose to prepay for a year of Noko in advance. Prepaying for a year of Noko during your trial will require you to enter a credit card and your account will be immediately moved out of trial. What happens if I upgrade or add or remove users during the pre-paid period of time? Good question! Your pre-payment acts like account credit. So, if you've paid for a year in advance, but want to upgrade, downgrade or add or remove users over the amount included in your plan, we'll move the next payment date accordingly to reflect the number of days of Noko service the remaining prepayment amount is buying you. Today is February 13, 2014. You have a Team Plan, with the next billing date being February 14, 2014. You pay in advance ($539.00 with the free month). Your next billing date is now February 14, 2015 (a year later). You realize that you need to upgrade to the Organization Team Plan. We don't offer refunds for yearly pre-payments if you choose to cancel your Noko account during the period you have pre-paid for. Yearly pre-payments are a long-term commitment—we mostly use this upfront money to invest back into Noko and pay for new feature development.